Welcome to CME on ReachMD. The following activity is brought to you by The France Foundation and is titled, Exploring the Patient Journey: Let’s Talk About Interstitial Lung Disease and Idiopathic Pulmonary Fibrosis. This CME activity is supported by an independent medical educational grant from Boehringer Ingelheim Pharmaceuticals, Incorporated and Genentech. Visit ReachMD.com/CME to review faculty disclosures and learning objectives for this activity. Here is your host, Dr. Jennifer Caudle. This is CME on ReachMD and I am Dr. Jennifer Caudle. Joining me to discuss interstitial lung disease, with a focus on idiopathic pulmonary fibrosis, and the importance of early recognition, are Dr. Kevin Flaherty and Mr. Gary Cunningham. Dr. Flaherty is a Professor in the Division of Pulmonary and Critical Care Medicine at the University of Michigan Health System. Mr. Cunningham is a Patient Ambassador for the Pulmonary Fibrosis Foundation, and he was diagnosed with idiopathic pulmonary fibrosis in 2011. He joins us from Troy, Michigan. Dr. Flaherty and Mr. Cunningham, welcome to the program. Well, thanks for being with us today. Dr. Flaherty, let’s begin with you. Can you briefly provide an overview of interstitial lung disease and where idiopathic pulmonary fibrosis fits in within this group of lung diseases? Sure, interstitial lung diseases are a very diverse group of disorders that affect the parenchyma of the lung. They can have inflammation that leads to fibrosis. In some cases, we know what the cause of interstitial lung disease is, such as an autoimmune disease, and we target therapy towards that underlying disorder. Sometimes we can identify an exposure, such as a drug that a patient is taking or an occupation or a hobby, and patients do better if we can remove those things from their environment. In many cases, the disease is idiopathic, meaning that it’s spontaneous, or we don’t know what the cause is, and of those, the prominent one that we talk about is a disease called idiopathic pulmonary fibrosis. And what are some of the signs and symptoms that might be suggestive of interstitial lung disease and, more specifically, idiopathic pulmonary fibrosis? Yes, that’s a really important question because the signs and symptoms of interstitial lung disease, which are the same as the signs and symptoms of idiopathic pulmonary fibrosis, are very nonspecific. The most common symptoms that patients have are cough and shortness of breath. So, obviously, those are very, very common symptoms presenting to primary care physicians, even to subspecialty physicians. So, the key is, once you’ve looked at the common things that cause cough and shortness of breath, things like COPD, things like cardiac disease, things like asthma, it’s appropriate to evaluate those things first. But when that doesn’t come to an answer, the next important point is to remember to think about interstitial lung diseases as another less-common cause of the common symptoms of cough and shortness of breath. Once you suspect interstitial lung disease, the physical exam is also very helpful. What you want to do to try to identify interstitial lung disease is to identify crackles. The crackles are a sound that fibrosis makes as a patient is inhaling. It’s best to listen in the very bases in the posterior aspects of the lung fields, because that’s where interstitial lung disease often first develops. It’s important when you’re trying to detect particularly early crackles, that you press very hard with the stethoscope against the chest wall to try to get as close to the lungs as possible, and that you have patients take a really, really deep breath. And it’s at that end of inspiration where you can hear some of the subtle crackles. And if you have a patient that’s presenting with cough and shortness of breath and you listen and you hear crackles that should really raise your index of suspicion, that interstitial lung disease may be present. And we actually have an example of what crackles sound like that people will be able to listen to on this recording. Great. I actually think that’s very helpful to hear those crackles, which is, as you mentioned, very important in the diagnosis. Let’s now turn to our Patient Ambassador, Gary Cunningham. Gary, looking back at the time before your idiopathic pulmonary fibrosis diagnosis, can you describe the symptoms that you had that prompted you to visit your primary care doctor? Seven years ago I had a habit of climbing 10 flights of stairs to get to my office each morning. When I started having problems making that journey, I was short of breath, but that’s not what bothered me the most. What bothered me the most was my legs were just burning up on walking. And I really thought that I had some sort of a circulation problem. And since I had a history of elevated cholesterol and triglycerides, I figured I had some sort of circulation problem. So, I went to my primary care physician who referred me to a cardiologist who basically ruled all that out, initially. Then, going back to my primary care physician, he was saying, “let’s look at the shortness of breath.” And it was at that point that I told him that I had a family history of pulmonary fibrosis. I actually come by this disease honestly. I guess I inherited it. My mother was diagnosed with this disease at age 60 and died of it at age 61. Her father also died of this disease at approximately age 64. So, having known that, they obviously turned their direction towards the pulmonary people. They quickly came up with the diagnosis. That’s really interesting, you talking about your strong family history. And it also really speaks to how important it is to know what our family history is and to bring that up, so it’s really great that you did that. My next question, I feel like you kind of answered, but maybe you can speak a little bit more about your process and diagnosis. Was your doctor suspicious early on that you had interstitial lung disease? Did you receive other diagnoses between going to the cardiologist and seeing your primary care doctor again? What was that process like when you were getting worked up? Well, first off, it was scary. It was very scary, because once we started thinking about the fact that it could be pulmonary fibrosis, obviously, I knew how deadly of a disease that was. So, it was a very scary process. But, fortunately, for me at least, my primary care physician was very well-known at the hospital that I was being treated at here in Detroit, and he got me into one of their best pulmonologists. He really took a big interest in my case and did a CAT scan right off the bat, just based on that he was 99% confident that it was pulmonary fibrosis. We had talked about even doing a confirming biopsy, but the more that we talked about it, the fact that my strong family history and the clear indications on the high-resolution CAT scan, that there was probably no need to do a biopsy. I then subsequently went and got second and third opinions. So, I’ve been diagnosed by at least 3 pulmonologists, who have all concluded that yes, the original diagnosis was proper. It sounds like you’ve been receiving excellent care and a relatively prompt diagnosis, especially with your knowledge of your family history and seeing different doctors, which is wonderful. Dr. Flaherty, I’d like to come back to you a little bit. We’ve heard Gary’s story. Can you maybe talk a little bit about potential diagnostic delays in other patients and with other physicians that might be common with idiopathic pulmonary fibrosis? 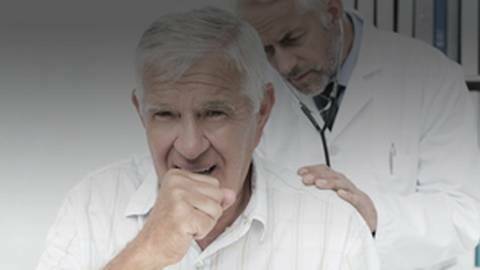 Unfortunately, most of the times, the time to diagnosis is longer and that gets back to the symptoms being very nonspecific, and the disease being less common than other causes of cough and shortness of breath. Given that these interstitial lung diseases, particularly pulmonary fibrosis, are progressive, making an early diagnosis is really critical, because the sooner that we can intervene, the sooner we can prevent loss of lung function. I think that’s one of the key messages: when patients have cough and shortness of breath, listen very hard for crackles. If crackles are there, they shouldn’t be. Certainly, many things cause crackles, heart failure and whatnot, but don’t forget about looking for interstitial lung diseases. If you’re just tuning in, you’re listening to CME on ReachMD. I am Dr. Jennifer Caudle and I’m speaking with Dr. Kevin Flaherty and Mr. Gary Cunningham about idiopathic pulmonary fibrosis. So, let’s continue, Dr. Flaherty, can you explain the diagnostic process for idiopathic pulmonary fibrosis? Sure. Briefly, as we talked about earlier in this program, you have to suspect that it’s present. And on a CT scan, I think we have an image of this to help illustrate it, what a usual interstitial pneumonia pattern looks like, by CT, is we see reticular fibrotic changes that are worse in the lower lung fields and are worse in the periphery of the lung. There are areas of pulled open airways that we call traction bronchiectasis, and then a key feature, is honeycomb cysts. They look like bee’s honeycombs around the periphery of the lung lined up. On a CT scan, when we see those features, peripheral lower lobe predominant reticulation with traction bronchiectasis and honeycombing, that is the pattern we call “usual interstitial pneumonia.” That does not equate with idiopathic pulmonary fibrosis. You can see this pattern of UIP, or usual interstitial pneumonia, in lots of different diseases, but when you have idiopathic usual interstitial pneumonia, that’s what we call idiopathic pulmonary fibrosis. Now, in some patients, the CT scan doesn’t show all those features. It tells us that there’s something abnormal going on, that the features are a little bit atypical or maybe much more subtle, and it’s in those patients, much like Gary discussed, that we consider what are the risks and benefits of doing a surgical lung biopsy? We can look at a microscopic level for those same types of features that we see and we call usual interstitial pneumonia. That’s a very helpful algorithm to go through and diagnostic features that we need to remember. Mr. Cunningham, you talked about your path to diagnosis in the first half of our program. For those who are just joining us, you did talk about when you were referred to pulmonology. Maybe you can just kind of briefly remind us of when your pulmonary referral happened in the course of your workup, but also you mentioned that you didn’t receive a surgical lung biopsy. Did you get the high-resolution CAT scan? Yes, I did. But, just to back up a little bit, there was quite a bit of delay there in my diagnosis because both my primary physician and myself, quite frankly, were assuming that my problem, at that time, was circulatory in nature and not pulmonary. My prior history, my whole medical history, the only blips on it were triglycerides and cholesterol elevated, slightly elevated, not even really super high, but that was the only thing in my history that would indicate some problems. I ended up spending quite a bit of time over in the cardiac department, trying to figure out whether or not I had a cardio problem, before it dawned on us that maybe we should be looking at the lungs rather than the heart or the circulation system. Even knowing that I had a history of it, I even went to a false conclusion too. So, I think the point that needs to be stressed is that it is very easy to overlook this disease. In my case, even though there were a lot of road markers there to tell us where to go, we kind of ignored them, initially. So, it took, probably, at least 6 months before I got over to a pulmonologist. It’s really interesting that you had a family history and you’re saying that it didn’t immediately come to mind. We were all assuming that I was having circulatory problems and not lung problems. That was a false assumption, obviously, on our part, and it wasn’t until the referral was made over to pulmonology that I was actually offered, and obviously took, the high-resolution CAT scan. And then, the pulmonologist, at that point, said, “based on your history and high-resolution CAT scan, there’s no doubt in my mind that what you have is pulmonary fibrosis.” My only open question is whether it’s genetic or familial in basis or idiopathic, but at the end of the day, it doesn’t really matter because the outcome would be the same. So, they ultimately decided that it was going to be called idiopathic pulmonary fibrosis and that’s the official diagnosis that I was given very late in 2011. That’s very helpful to keep in mind. I’m a primary care physician myself, and I know all the physicians and healthcare providers listening, this is a very important program to remind us to keep this in our differentials. And that’s one of the points of this program. Dr. Flaherty, how valuable is it to have images and testing available early on for referrals, like Gary’s? When our patient gets to pulmonary, how important is that? It’s very helpful if patients have had their imaging already to have them bring that with them so we can actually look at the images at the appointment. We’re seeing people we often know what the referral is for and want to make sure that we have all the appropriate tests and data to try to make those visits as efficient as possible, as opposed to the unfortunate scenario of someone arriving and expecting everything was there and you really don’t have all the data to come to any conclusions or provide any useful information and you spend a lot of time backtracking. So, having that information at hand and being able to look at the actual images is really helpful. If I can just interject there. In my case, when I wanted to get a second opinion at the University of Michigan, they told me about that and I got all of that information and sent it over to them in an electronic format, before I even went in for my first appointment. And the same was true when I went over to Spectrum Health, over in Grand Rapids, as well. And as a result, those pulmonologists, obviously, had everything they needed to look at before I even went in for an appointment. They were able to utilize that information and confirm the diagnosis. That was very helpful for you to provide all of that. Let’s talk a little bit about treatment now. 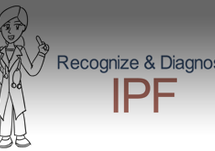 As of 2014, there are now two drugs approved for the treatment of idiopathic pulmonary fibrosis. The question is, or one of the questions rather is, should all patients diagnosed with IPF be started on antifibrotic therapy? What are your thoughts about this, Dr. Flaherty? Yes, let me just back up and talk about what the therapies do and I think that actually helps then answer your question about appropriateness of therapy. The two agents that are approved, one is called pirfenidone which is an oral agent that’s taken three times a day and it does have antifibrotic properties, probably targeting transforming growth factor beta as well as other pathways. The second agent is called nintedanib. It’s a twice-a-day oral agent that is a tyrosine kinase inhibitor and actually targets many different tyrosine kinases. Both of these molecules seem to have antifibrotic effects. And the potential benefit of either of them, and we believe that they are equal in efficacy, they’ve never been compared head to head, but against a placebo each of them seem to have similar effect. The expected benefit is that it will slow the decline in lung function. It’s important to note that these drugs will not stop the decline, so we need to continue clinical trials and research; they will not improve lung function, so our patients that we start on these medicines will not feel better, and that’s an important expectation. Each of these medicines have potential side effects. The common side effects of pirfenidone are nausea in about a third of patients, also, photosensitivity in upwards of 20%, if they have sun exposure, so we really emphasize sunscreen and trying to avoid direct sun exposure. With nintedanib, the most common side effect is diarrhea, so it’s common for patients to have to use antidiarrheal agents. We also need to monitor liver enzymes for three to six months and then periodically with both agents. So, when you look at these medications, and you have a progressive disease, it’s really a conversation with each patient in the stage of their disease of: do you want to start either of these medicines? We believe that they work at all stages of disease and we believe that the disease progresses through all stages, from very mild to moderate and severe. So, on one hand, some people will take an approach of start as early as possible in every patient to try to prevent loss of lung function. On the other hand, we also know that IPF tends to progress intermittently. It’s not every day a little bit worse. Sometimes you can have fairly long periods of stability. So, some patients will say that, listen I have very mild disease, I feel good right now, I am already on a lot of medicines, and I don’t want to take another medication as well. I should also mention that these medicines are expensive. Either one of them is just under a hundred thousand dollars a year, so there’s a prior authorization process that has to be gone through to try to obtain coverage to obtain either one of these medications. That’s very important information to keep in mind. Looking at the patient and the treatment plan from a comprehensive standpoint, in addition to these antifibrotic therapies that you mentioned, what are other aspects of idiopathic pulmonary fibrosis disease management that our audience should know about, and that physicians should be on top of? Probably the most important thing is just general health, exercise, physical activity, perhaps a pulmonary rehab program. As people develop symptoms of shortness of breath, it’s really common for us to limit our activities so we don’t feel short of breath. So, there’s deconditioning that plays a large part of the symptoms of pulmonary fibrosis. And there are well-done clinical trials of pulmonary rehab showing that through pulmonary rehab patient’s shortness of breath will decrease, their activity level will increase, and those are independent of any changes in lung function. So, exercise, exercise, exercise is key. Hypoxemic patients, patients who have low oxygen, need to use supplemental oxygen to prevent secondary pulmonary hypertension. We want to prevent infection. So, vaccinations, influenza every year, are you up to date on your pneumonia vaccine? Treating comorbidities. Sleep apnea, it turns out to be very, very common in patients with pulmonary fibrosis, so looking for comorbidities. Treating their cardiac comorbidities, treating their diabetes. Again, keeping the patient as healthy as possible so that as the lungs get worse, they are really, really healthy and able to deal with worsening lung function, despite having some comorbidities. And then, lastly, one risk factor for interstitial lung disease, particularly any type of pulmonary fibrosis, is cigarette smoking. So, if patients are still smoking, obviously smoking cessation is key. Gary, let’s hear some of your perspectives. What are your recommendations for other patients with idiopathic pulmonary fibrosis and for doctors who may be involved in their diagnosis and care? Well, I always tell people I was very happy that I went ahead and got second and third opinions, so that there was no doubt in my mind what I was dealing with, and that I would get my head around it. I think that was important for my support group, my family, to understand what challenges we were going to have. So, that was very important, but also what was important was I got involved in a support group very early on. That really helped me a tremendous amount. It helped my wife as well. Just grappling with the emotional side of this as well as the physical. And, as a result, we got active in the Pulmonary Fibrosis Foundation. And both of us have now become ambassadors for that organization and we’re very proud of that. The other thing that I would highlight that Dr. Flaherty’s already touched upon is that pulmonary rehabilitation is critical. I truly believe that one of the reasons why I’ve been able to go as long as I have without a lung transplant is because of the rehabilitation that I’ve gotten along the way. I still go three times a week, whether I need it or not. I think that has been very, very good for my overall general maintenance of health over the past five years. That is very helpful. As a physician it’s very helpful to hear and I know that patients really can benefit from your experience, and your advice, and your recommendations. Before we close, Dr. Flaherty and Mr. Cunningham, is there anything you’d like to add that maybe we didn’t get to during this interview? I think we’ve hopefully provided a good summary highlighting the importance of looking for interstitial lung diseases. The symptoms are nonspecific: cough, shortness of breath. Listen hard for crackles. If crackles are there and you’re not suspecting interstitial lung disease, obtain pulmonary function studies and consider a chest x-ray or a high-resolution CT scan, and that there are therapies available, and the sooner we can make the diagnosis the better chance we have of preventing loss of lung function. That’s wonderful. What a great summary. Dr. Flaherty and Mr. Cunningham, I really want to thank you so much for joining us today to talk about interstitial lung disease and idiopathic pulmonary fibrosis. It was wonderful having you both on the program. Thank you. Yes, my pleasure. Thank you very much. Thank you for having us as guests. This segment of CME on ReachMD has been brought to you by Tthe France Foundation. 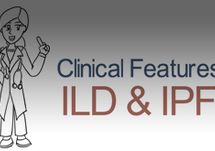 For more information on ILD and IPF, please see the related content on the activity page. 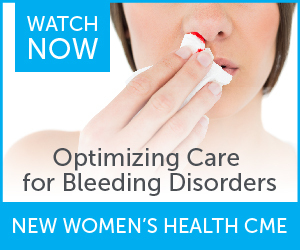 To receive your free CME credit, or to download this segment, go to ReachMD.com/IPF. Join Dr. Caudle as she discusses IPF with physician, Dr. Flaherty, and patient ambassador, Mr. Cunningham. This discussion highlights the challenges with IPF diagnosis, explains when to refer, analyzes the need for personalized medicine, and demonstrates how to keep patients on treatment. This educational activity is intended for primary care providers. Kevin R. Flaherty, MD, MS, has consulted for Boehringer Ingelheim Pharmaceuticals, Inc., Roche/Genentech, Fibrogen, and Veracyte. He has also done contract research for Afferent, Boehringer Ingelheim Pharmaceuticals, Inc., and Roche/Genentech. Gary Cunningham has nothing to disclose. Successful completion of this CME activity, which includes participation in the evaluation component, enables the participant to earn up to 0.50 MOC point(s) in the American Board of Internal Medicine's (ABIM) Maintenance of Certification (MOC) program. Participants will earn MOC points equivalent to the amount of CME credits claimed for the activity. It is the CME activity provider's responsibility to submit participant completion information to ACCME for the purpose of granting ABIM MOC credit. Aggregate participant data will be shared with commercial supporters of this activity. This activity is supported by an independent educational grant from Boehringer Ingelheim Pharmaceuticals, Inc., and Genentech.